Hope this e-mail finds y'all well. I am setting up a 220g (72"x24"x30") tank at a senior assisted living community that I work at in one of our memory care/activity centers as studies have shown the benefits of aquarium stimulation in seniors with dementia. two be beneficial or not? Second the Lifegard external heater chambers, would they work, any experience with them and are they worth it? Moving on. The aquarium will have approximately 200lbs of cichlid sand (white), 100-150lbs of lace rock, stacked in two separate piles one larger than the other (in theory anyways, we all know how much rock work gets moved) set on egg crate and possibly glued, and Black painted background. The goal is to have as much color and movement as the aquarium would allow with all stated above equipment. Number of fish and direction is where I tap out. Thank you guys and girls in advance for your response. I am really striving to get this aquarium as right as I can for the benefit of our residents and their families. Wow that was a quick response. Yes the Hydor I am referring to would be the in tank Koralia. I will most definitely send pictures upon completion. Tank was just ordered so another 2-4 weeks for glass and stand/canopy to come in. I've looked at some of the cookie cutter guides and well they just don't go to 220, unless I'm not looking right. And I don't want to start just doubling, tripling, etc. because I know it doesn't always work that way. So I guess that's where I'm needing a little more assistance/guidance. Well yeah the cookie cutter thing was a different site. Sorry I get quite in depth in research sometimes and get completely lost on where it came from occasionally. Stocking. What African cichlid fish to put in this massive piece of glass to get the most bang for the buck...most color and most movement. When it comes to maintenance it pretty much falls on me. I have kept haps and peacocks before and have done fairly well. or else pairs, and the females have such a hard time they often die prematurely. Tanganyikans are less sexually dimorphic; Tropheus for example would be an outstanding choice in a really big tank because they're extremely beautiful but also less prone to aggression in large groups. One thing about Tropheus is you basically can't mix them with anything. Partly it's because of the need for large groups. If there's space for another fish... add another Tropheus! But partly it's their diet. They must have virtually only algae-based foods. Easy enough with the right flake food. filters, two heaters on separate thermostats, two battery backups and the circuit the tank is on is also on a 500kw generator that will run for 5 day as I have kept fish for 15 years and I know about water chemistry and all that fun stuff. I tend to plan for worse case situations and also discuss all the options. I've discussed South Americans and goldfish and Africans is the way the company is wanting to go. I appreciate the very detailed response and I will surely try again. Hey yall! Always my go-to site when i have questions. :) Ok, so, I've got a question about my current setup that i was hoping you could help me with. 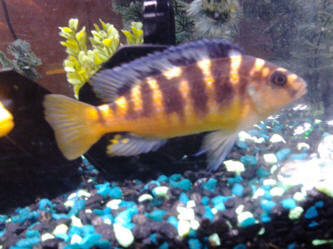 I currently have 6 yellow lab cichlids, 3 kenyi cichlids, and 1 electric blue johanni. The problem i have is aggression, mainly the johanni. of people recommend "overstocking", but being I've always been told that's a huge no-no, I'm hesitant to do it and don't know the proper amount. Water parameters are all good. Ammonia:0 nitrites:0 nitrates:5. I was wanting to get yalls opinion on it, as this is my first cichlid tank. I really appreciate it. I've tried to get the johanni and isolate him from the others, but that is one smart fish. Short of draining most of the water and pulling the 60lbs of rock out of the tank, he is impossible to nab. Just some additional information. The tank is about 5-6 months old. The cichlids are all still juveniles, so i was thinking maybe this could have something to do with sexual maturity? Or is it a stocking/species issue? I understood that there is general nipping and aggression in a cichlid tank, but he's (the johanni) going all out and chasing pretty much anything that moves. 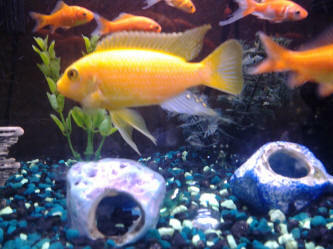 and i am unsure exactly what breed the yellow cichlid is. Within the last month my bumblebee and yellow locked mouths for a bit (never had this problem but one other time when i moved them to my bigger tank) and now the yellow stays in his/her hidey spot and my bumblebee is extremely dark 24/7 now. I have not vented them to see who is a boy and who is a girl. But within the last week besides staying extremely dark most of the time the bumblebee is extremely fat. Is he/she trying to spawn with my yellow cichlid? The bumblebee seems extremely agitated and continuously biting and chasing my 2 Plecos (also same age) if they are in the front of the tank or near the yellow cichlid. If it is a girl and is full of eggs to lay, if she doesn't get the chance is she gonna be okay? 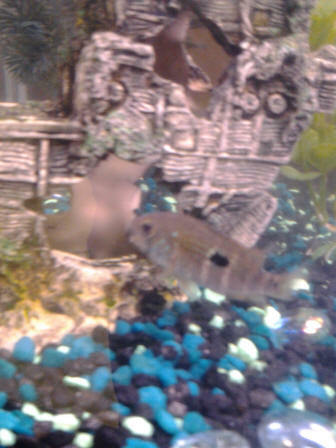 Also, can you help me figure out what Speckles my yellow cichlid is?? you immensely for any information and thoughts!!!! Thank you!!!! I am sooo appreciative of you responding. I may try to vent them later i just did a water change so they are mad at me. Also i will get my slightly smaller tank reset up to place the terror elsewhere. - Metriaclima Lombardoi male; 4-5"
- Pseudotropheus Socolofi male; 3-4"
- Aulonocara Baenschi(?) 1m, 1f; 3-4"
-Melanochromis Paralellus will be selling 40-50 fry when they get about 2" or so, and there is another batch on the way, Female is holding again! If you can help me with pricing these fish I would really appreciate that! Well my fiancé and I are fairly new to having cichlids but I have done a lot of reading up on them and still have so many questions. They are in a 50 gallon tank lots of hiding spots (clay pots and caves). Most of them are African except one or two, which I have heard is uncommon (We had purchased them early in our hobby). They have gotten along fine now for months so I believe they are okay. I know we have two spotted jewels (one is red the other is a Pearl color), two peacocks, three Kenyi's (one blue and the other two yellow) , and one dwarf pulcher I believe. Then in a separate 30 gallon tank I have two black convicts (1 male 1 female) that are getting along great (already have eggs). First off my fiancé put red lava rocks in our tank and I am against it because I'm worried they are to sharp to have with our fish. Is this something I should insist he take out. Second, one of our yellow Kenyi has had an increased darkness is the stripes and face what could this be? The Kenyi had some eggs laying on one of the pots but now they are gone. What could have happened to them? I have seen some pictures of rainbow colored cichlids and I'm really looking for something that color that we could add to our tank, any suggestions. Our fish now are mostly friendly for cichlids I suppose, every time we add new fish they just check the new Guy out a little but I feel they aren't too aggressive. About how many fish could our 50 gallon keep? Also does the white spot on the bottom fin always mean it's a male? How can I tell the difference of gender? Hi there, I was curious as to the tank requirements for a Red Empress. I have a 30 gallon that I have previously used for cichlids and was wondering if it would be large enough. <Not a chance. Adults are up to 15 cm/6 inches in length, and the males are aggressive towards each other (and not exactly gentle around the females). I like to do my research before taking in animals and I want them to have the proper habitats, and that is why I am so thankful that you guys at WWM give such good advice! Hi there, and thank you so much for the info! Like I said, I always rely on your advice! But I do have another question. I have another 30 gallon with one male Haplochromis (Pundamilia) nyererei and I was wondering if it would be possible to get another of the same species and gender in the tank. I know that our boy is extremely aggressive (killed the rest of the fish in the tank!) so I was hoping that to put another of the same aggression level in there with him would work out. I think that this species is the most beautiful and would like to have another, but I am unsure if they are too territorial or simply too aggressive to have with other fish. If it would not work out with another of this species, what other fish would be suitable? Or is the tank only large enough for our Haplochromis (Pundamilia) nyererei friend? I suppose I will be keeping just this fish then. I did not know to much about it when I got it, well, the breeder told me a bunch of info, but it was all wrong. So now I can only have this one fish in my tank? Will he be alright in the 30 gallon by himself? Well, I actually have a Pictus catfish in there too, and they seem to get along just fine. Like I said, I think he is just beautiful and I do not want to have to rehome him, as much as I like the look of a multi fish set up, it is not worth it to me if I cannot have the fish that I love so dearly. Those of you who have been reading Malawi Cichlid Homepage ( www.malawicichlidhomepage.com ) will know that we have not been doing the regular monthly updates for a while due to serious technical problems. We have now relocated and restructured the site to allow for much better functionality. Our new address is www.mchportal.com. Today is our "official" launch of the new site. As of now we will continue, as scheduled with our monthly updates. Please take a minute to come and see the site and tell us what you think about it. For a list of this month's updates click on this link : http://www.mchportal.com/mch-updates-mainmenu-30/1-latest/6-update-30-september-2008.html . Thank you.-- George J. Reclos Ph.D. Questions about Cyphotilapia frontosa Hello, Did a search on the Frontosa, but not much info out there. Was wondering if I could get help in correct care for these fish. I have 2 fish, approx 3"/4" long in a 100 gallon tank. Tank temp is 80 degrees Fahrenheit. Tank is filtered by two Emperor 400 gal/hr bio filters. They are the only fish in the tank except for some feeder mosquito fish which they seem to be ignoring. What would be the correct feeding for these fish? Any other info would be most appreciated. 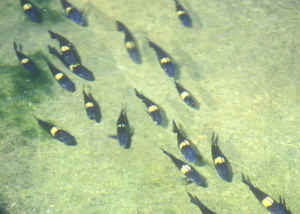 < Your Cyphotilapia frontosa are found all over Lake Tanganyika. They are primarily found in deep water. The water should be hard and alkaline. Your filtration is fine. They get up to 35cm. There are many different geographic variants so you should not mix Frontosas from different areas. One male to two or three females is best. In your tank you could probably have a group of up to 6 fish. 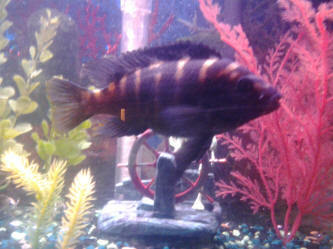 In they wild they eat sleeping cichlids at night, so they will never chase your feeders. They like shrimp and worms when they are small but will accept pellets and flake foods too.-Chuck> Thanks, FrankF African Cichlid Omnibus Hi, and thanks for the great site. I am preparing to set up a new tank. It is a 72" x 24" x 30" that I will be using primarily for African Cichlids. I have read so many conflicting articles and I'd like to set this up right from the start. 1. what is the absolute best filtration system/s I can use. Should I use wet/dry, add refugium? supplement with mechanical? < The best filter is the one that you are able to service quickly and easily. I prefer hang on the back power filters such as the Emperor series from Marine land. Two emperor 400's will pump up to 800 gallons per hour. The bio wheels will provide plenty of biological filtration> 2. what kind of substrate? < If you plan on keeping Mbuna then they really don't require that much sand. An inch or so of well washed sand should be plenty.> You could use crushed coral if you live in an area where the water is soft. Many people find it too bright and it washes out the colors of the fish.> 3. What is a recommended model of each of these? 4. What about fluidized bed filters? I have read that they keep down nitrates? Is this true? < Fluidized beds work pretty well as long as the power is consistent. The bacteria live on the outside of each of the beads. AS the water is pumped over them they do a good job of converting ammonia and nitrites to nitrates. If they are working properly they should be generating lots of nitrates from the fish waste. That is what you want to happen.> 5. What size pump for the wet/dry? < At least one that will pump 500 gallons per hour.> 6. I have several fish I will be transferring from other tanks and I'd like your opinion on how many I could add. I have a giraffe catfish, < This catfish will eventually get too big.> 3 jewel cichlids, < Although these do indeed come from Africa they are not rift lake cichlids and would not be able to compete for long with the others.> 2 bumblebee cichlids, < Pseudotropheus crabo is one of the larger Mbuna from lake Malawi and may turn very dark as it gets older.> 1 electric blue, < Only the males color up. Females stay a silvery gray color. The males may not color up unless there are a couple of females in the tank.> 3 elec. yellow. < These fish are relatively peaceful for Mbuna.> I would like to add some peacocks to this mix, and maybe some red zebras. < Red zebras and peacocks would go well in this tank. Look for a book by Ad Koning called " Enjoying Cichlids:. There is lots of good information about cichlids that will help you.-Chuck> Please advise, thanks, Jim G.
Cichlid Tank I have a 220 gal tank I'm setting up for Tanganyika cichlids I will have a 5" inch bed of CaribSea rift lake authentic with about 200 pounds of moon rock. I was thinking about using HDL tri base palletized carbon with the right now bacteria and wondered if you have knowledge or experience with it's use. <have not used it myself> I have some mineral mud that looks more like dirt and wanted to grow some mangroves or house plants and maybe some aquatic plants. I was wondering what types to use seeing as some absorb ammonium/nitrites/nitrates better than others. <Anything fast growing should work fine.> Also I would like some suggestions on what types of animals fish and inverts that are available to use in this endemic tank, <I would invest in one of the many books available on Tanganyikan cichlids, there are plenty of choices, it is really up to you http://wetwebmedia.com/FWSubWebIndex/afrcichlids.htm > by the way the carbon would go in place of the bio balls, I was maybe thinking of using lava rock. <avoid the lava, too much potential for problems. Best Regards, Gage> or maybe a mix of that with cichlid mix with tufa chunks any suggestions please thank you in advance.